Smoke trails near the head of this dragon as if the fantasy beast has just finished a violent rampage of the countryside. The Black Dragon Head Incense Burner creates the perfect atmospheric effect for the legendary creature. 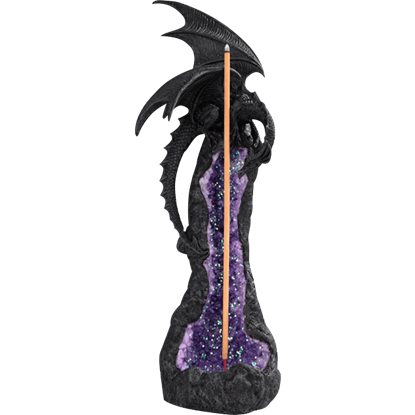 The smug look on the face of the dragon in the Black Dragon Incense Burner, combined with the rather large collection of purple crystals within the geode burner, leads you to believe it has just stumbled upon a great treasure. 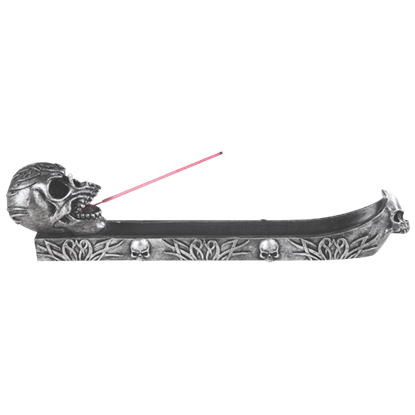 Create an atmospheric effect by lighting your favorite incense using this Black Skull Incense Burner. 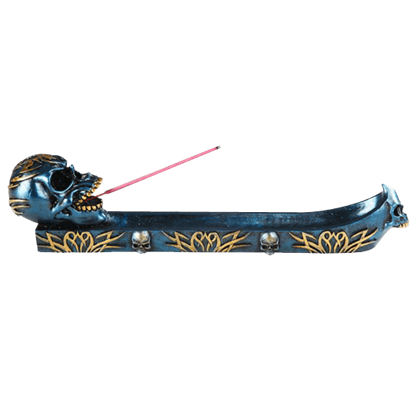 The decorative incense holder features a wicked looking skull at one end of a long tray, its jaws open to hold the smoky stick. The next time you enjoy the scent of your favorite incense, do so with the Blue and Gold Dragon Incense Burner. 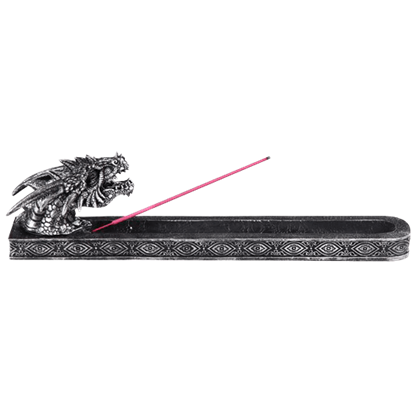 This fantasy incense holder features a dragon perched on one end of the bed, artfully crafted to resemble an open geode. 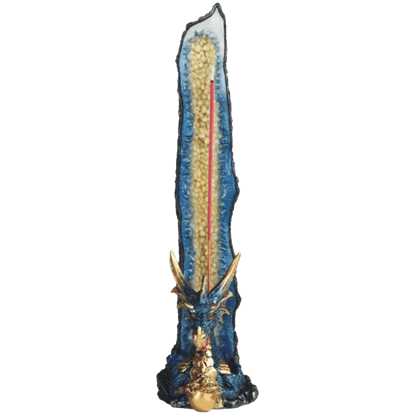 A fantasy scene of action unfolds upon the Blue Dragon Castle Incense Holder. A blue and gold dragon roars towards a castle tower, situated upon a tall outcropping of rock. This cold cast resin incense holder is painted by hand. 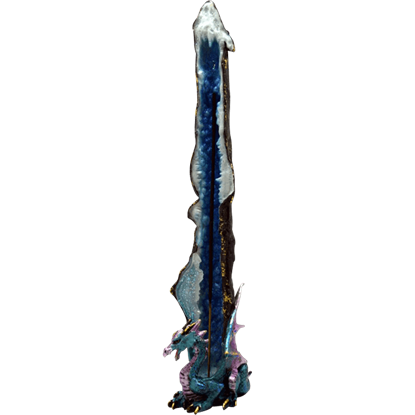 Whenever you have the desire to inhale the sweet smell of your favorite incense, do so using the Blue Dragon Geode Incense Burner! 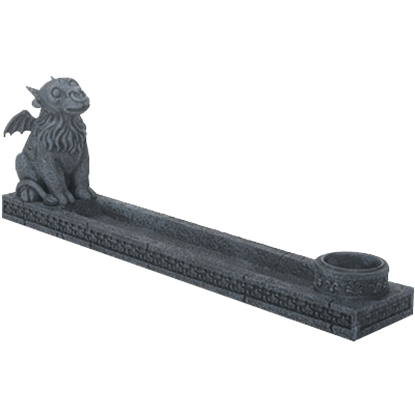 This incredible dragon incense holder is an excellent way to show off your love of all things fantasy! Your incense is safe under the watchful eye of this grim dragon. 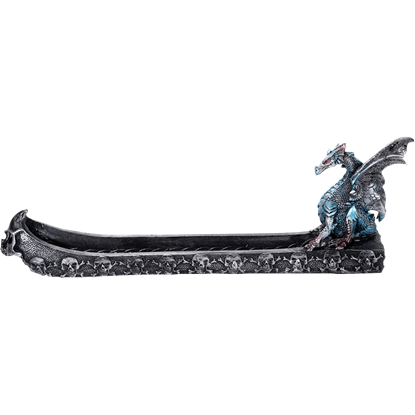 The Blue Dragon Skull Boat Incense Burner shows the silvery blue fantasy beast perched on the end of a silvery boat perfect for catching the ashes of burning incense. 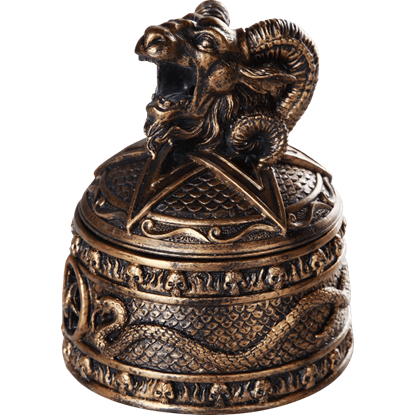 Prepare to enter a world of mysterious scents and mystical delights when you bring home the Blue Dragon Standing Incense Burner. This unique incense stand can support either a stick or cone of your favorite incense. The next time you fill your home with the scents of your favorite incense, do so in fantasy style. 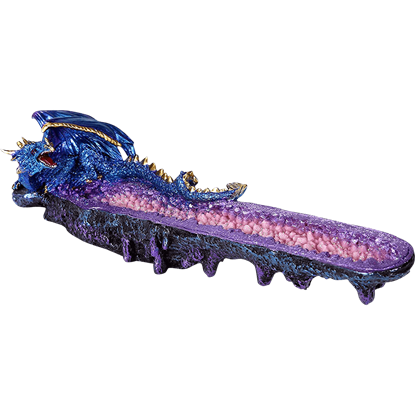 The Blue Geode Dragon Incense Burner is a remarkable and unique piece of dragon home decor featuring stunning, geode-inspired details. Honor the journey from life to death in ancestral tribute. Add a gothic flair to your home decor collection. 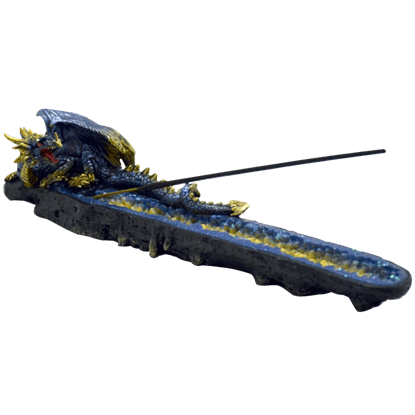 The Blue Skull Ferryboat Incense Burner beautifully honors the realm of the underworld with a decorative Gothic touch.